As college basketball falls more and more out of the mainstream consciousness*, it gets harder to motivate oneself to a) follow the sport in the regular season, and b) fill out a bracket with the dedication and research, or in the timely manner, that was once en vogue. *- A 2010 Gallup poll ranked college basketball the 8th most popular sport among Americans, down from 3rd in 1991. Having said that, Kentucky is your undefeated, gargantuan favorite. There are no appointment-watch one-and-done players, such as Kevin Durant, Derrick Rose, and Michael Beasley from years past (DeAngelo Russell at Ohio State is the closest). There are no appointment-watch white guys a la Adam Morrison or the Jimmer. All we have this year is a lot of parity, which hopefully leads to a lot of close games and a lot of clever “NOW ITS OFFICIALLY MARCH!!! !” comments from the announcers. Favorite: Since we mentioned Kentucky, why not start here? 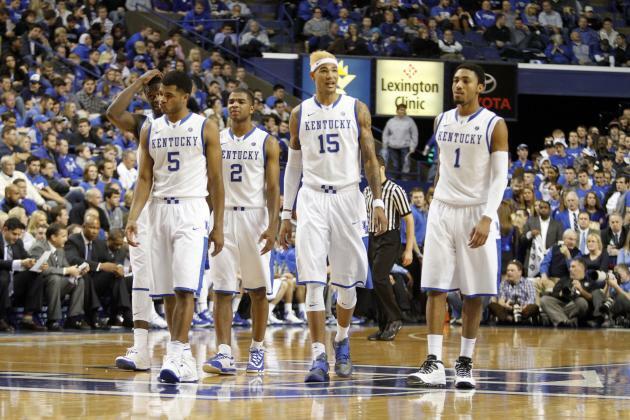 Kentucky’s roster would be the second-tallest in the NBA, only behind Portland. Forward Karl Anthony Towns is gaining momentum as the #1 pick, twin guards Aaron and Andrew Harrison were ridiculous in last year’s tourney, and its going to take a parade of 3’s and an extreme off night to beat them. Other contenders: Well, #2 Kansas lost to Kentucky by like, 35 points earlier this season. That’s never good. The cavalcade of 3’s I mentioned that could beat Kentucky? It could come from 3-seed Notre Dame, who spreads the floor with four knockdown shooters. Sleeper: Going with #7 Wichita State. They were undefeated in the regular season last year, and still have a lot of those players. Insert catchwords like “moxie”, “poise” or “experience” here. And Wichita/Kansas in the second round could be a lot of fun. Super Dark Horse: #12 Buffalo? They led Kentucky AT Kentucky at the half back in December, which I realize means absolutely nothing. So whatever. Carry on. Best NBA Talent: The real reason most of the DYC staff is here. I’ve got to go with Towns, or Anthony-Towns, as I’m not sure if the Anthony is part of his first or last name. 6’10, agile, explosive, developing face-up game, Blake Griffin potential without the gaudy college numbers to back it up (because he has talent around him). Favorite: Logic would dictate I trump the #1 seed Wisconsin here, but (say it with me now) NEVER TRUST THE BIG TEN. Give me Arizona, who has the talent, length, and athleticism to challenge everyone, including the presumptive champs. Other Contenders: With Wisconsin being one, I don’t trust a slowdown-and-threes team. #4 North Carolina could carry the momentum from a nice ACC Tourney run…or they could bow out in the first round, and neither would surprise me. Quite frankly, not a single other team strikes me as Final Four-quality (which could explain why college basketball is so down). Sleeper: From the same template as Wichita State, VCU is the 7-seed, has recent success on its side, and has a legitimately terrifying ability to completely bury you. Next best guess? Their first round opponent, Ohio State, who just seemed to sleepwalk through this season and could turn it on. Super Dark Horse: #14 Georgia State. Seriously. They get an underwhelming 3-seed in Baylor in the first round, and could feasibly take out Xavier or Ole Miss in the round of 32. Why not? Nobody’s reading this far anyway. Best NBA Talent: A ton of good choices here. Arizona F Stanley Johnson and Ohio State G DeAngelo Russell are one-and-done lottery picks. There are great college talents such as Wisconsin three-balling C Frank Kaminsky, whose name you will hear a ton. I’m going sleeper here though, Arkansas F Bobby Portis, the SEC player of the year. Almost 50% on catch-and-shoot 3’s, 18 points per game in SEC play, and 6’11. And I had never heard of him til last week. Favorite: All about the V-schools here. I’d take #2 Virginia if Justin Anderson had proven he was healthy, but his complete inability to play offensive basketball in the ACC tournament with his broken pinkie has me steering clear. By default, then, you have #1 Villanova. Other Contenders: #4 Louisville has Rick Pitino and crazy person Montrezl Harrell, and plays a style that makes everyone uncomfortable (enter Pitino restaurant joke here). I have no reason to believe in #3 Oklahoma as they’re inconsistent. We’ve been beaten over the head with #5 Northern Iowa for me to say there’s no way. Sleeper: Realistic sleeper candidates include #10 Georgia sorry it’s just not happening; maybe the winner of the 8/9 game between N.C. State and LSU? Both teams have impressive strengths and no glaring weaknesses, and both have enough athleticism to compete with Villanova. Super Dark Horse: #11 Dayton hasn’t even qualified for the field of 64 yet, but they made a run to the Sweet 16 recently. #14 Albany could spring a first-round upset on Oklahoma. Best NBA Talent: A little tough to lock down here. Louisville’s Harrell is the only first-rounder according to the wildly inaccurate and speculative NBADraft.net. UVA’s Anderson is a big 2, but as I said he’ll be worthless at least the first weekend, so no help there. Go Harrell and enjoy his antics. Favorite: $&(@Y@&*#((! Shaping up just like their joke of a run in 2010, Duke arguably drew the biggest lightweights in the #2 (Gonzaga) and #4 (Georgetown) spots. Damnit. Other Contenders: Gonzaga has never made it to the Elite 8, yet we keep trumpeting them as a true contender. I’m on that wait and see. #3 Iowa State made a nice run last year and *pulls out megaphone* Fred Hoiberg’s team is the most entertaining team in college basketball. Watch them play if you can. I’ll go Iowa State as legit, #5 Utah as a light sleeper. Sleeper: #9 St. John’s. The Johnnies (I think Steve Lavin is still their coach) gave Duke 32 minutes of a game earlier this year, and could meet them again in the round of 32. With no overwhelming teams in the 4/5 pod, they could play for a shot at the Final Four potentially. Super Dark Horse: #10 Davidson. They won an A-10 that included VCU and others (don’t ask me to name them without research). Best NBA Talent: Duke’s Jahlil Okafor, Justice Winslow, and Tyus Jones. Okafor is a young Al Jefferson, Winslow is a poor man’s (insert crazy athletic young NBA wing), and Jones is a steady point who could top out as an offensive-minded CP3. F**k Duke. I guess, based on the above, that I have Kentucky/Arizona/Villanova/Duke as favorites to make the Final Four. No way in hell this happens, but in keeping with the format above, those are your best bets. If this comes to pass, Kentucky/Arizona, in my opinion, is for the title. And Kentucky wins. And demolishes Villanova or Duke. Let’s hope the parity shines through on the first weekend, because beyond that all we get is TruTV jokes. Posted on March 18, 2015, in Arkansas, Blog, College Hoops, Duke, General Sports, Kentucky, Louisville, NC State, North Carolina, Ole Miss, Picks, SEC. Bookmark the permalink. 1 Comment.